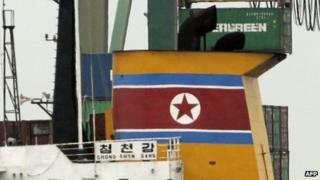 At the beginning of July, a short bulletin appeared on North Korea's state news agency. It described a visit by senior military officials to Cuba, and "comradely" talks there on "boosting the friendly relations between the two armies". The report, just a few lines long, was short on detail and easy to miss. It seems a lot more interesting now. The recent discovery of Cuban weapons on board a North Korean ship has taken many people by surprise, and led to questions about hidden ties between two countries. There are certainly a lot of similarities: both are small communist states that survived the collapse of the Soviet Union; both have successfully carried out dynastic successions; and both operate under US economic sanctions. Korean historian Kathryn Weathersby, adjunct professor at Johns Hopkins University, says the two countries have a long and close relationship. "They're the only fully communist countries still in existence, and they've both faced direct US military action, which has helped bind them together," she explains. A scan of recent North Korean media articles shows a relationship that is strong on public displays of communist support. Organisations such as the Cuban Committee for Supporting Korea's Reunification and the Korean Committee for Solidarity with Cuba make regular appearances, along with quotes from Cuban newspapers which backed Pyongyang during its recent stand-off with the United States. There are recent reports of cultural exchanges between the two countries, and of economic co-operation. And, perhaps most interestingly, a 2013 protocol for the development of science and technology, and an "exchange of goods". But there is no detail about what these agreements and exchanges actually consist of. Andrei Lankov, based at Kookmin University outside Seoul, spent time in North Korea during the 1980s, and specialises in Pyongyang's Soviet-era relationships. He says there's a great deal of symbolic importance attached to the relationship, but that in reality it doesn't amount to much "because North Korea is looking to trade for money, and Cuba isn't willing to pay much". "As far as economic exchange goes, it's negligible" he explains. "North Korea doesn't need sugar, and Cuba doesn't want to buy a lot of dried squid, for example, so they're not profitable partners." "Cuba isn't even in the top 10 trade partners for Pyongyang, and the huge distances between them make transportation expensive." The UN estimated that North Korea had an income of $500 per capita in 2011. Cuba was slightly better off, with $6,000 per capita, but its population is small - just 11 million people. So it is true that neither country is a natural market for the other when it comes to mainstream commodities, but what about weapons? Cuba has said it owns the weaponry found hidden on board the North Korean-flagged Chong Chon Gang - and that it consists of several obsolete Soviet-era missiles, anti-aircraft batteries, and MiG fighter jets. Experts at Jane's Defence Analysis have identified the parts as belonging to an "SNR-75 'Fan Song' fire control radar". They have suggested that it could either have been heading to North Korea for "repair and return" as the Cuban authorities suggest, or that North Korea could have intended to keep it in order to bolster its air defence capabilities. Both the Cuban and North Korean militaries are based on Soviet-era hardware, and finding components to service that equipment may be getting harder, says Moon Chung-in, professor of international relations at South Korea's Yonsei University. "It could be a sign that North Korea is struggling to get the parts it needs to service its military," Prof Moon says. "It's been ingenious in trying to plug that shortage domestically, but it still needs to import parts for its Soviet-era MiGs and other equipment, and it's been looking to countries like Syria and maybe Cuba to do that." Kathryn Weathersby says Pyongyang has been plugging the gap in military supplies for more than 20 years, since before the fall of the Soviet Union. "The USSR cut off guaranteed military deliveries when it established diplomatic relations with South Korea in 1990," she says, "and that has to have made it harder for Pyongyang to maintain its equipment". Recent sanctions against North Korea may have added to the pressure, she says. With the pool of Soviet-era equipment diminishing, Andrei Lankov says that Pyongyang is also keen to export its own "cheaper, lower quality copies of old Soviet and Chinese systems". Not many countries are willing to buy them, he says, but Cuba might be. Alternatively, some speculate that in a shrinking market, Cuba could simply be looking for someone to service its old Soviet-era equipment cheaply, perhaps in return for some of its spare hardware. Any shipment of weapons to North Korea, except for small arms, is banned under three separate UN Security Council resolutions - imposed after North Korea's nuclear and long-range missile tests. As a UN member state, Cuba would be breaking these sanctions. But James F Person of the Wilson Center in Washington believes that, with neat symmetry, Cuba also had a hand in kick-starting North Korea's weapons programme - albeit indirectly. The Cuban Missile Crisis of the 1960s was a key factor in "nudging North Korea down a path of unsustainable military build-up", he says. When Pyongyang saw how the crisis played out, and found the flow of military aid from Moscow drying up, it decided to bolster its military defences itself. The result, he says, is the nuclear-capable, economically-ravaged North Korea that the world is watching so closely today.